Scott Fox is available for radio, podcast, TV, and press interviews as well as conference speaking, including keynote addresses and panel moderation/participation. His expertise in startups, entrepreneurship, angel investing, Internet strategy, online marketing, e-commerce, digital media, and years of success online make Scott a popular and frequent speaker and radio/podcast/TV guest. Unlike many “Internet Gurus”, Scott’s expertise and personal business model is not based on selling books. Instead, Scott is a self-made millionaire and an Internet business pioneer who raised Venture Capital for his first company way back in 1996. His message is informed by his own personal success as a startup CEO, serial founder, strategy coach, and active angel investor. His books are published by the American Management Association (AMACOM) and are available in paper back, hardback, and audio versions in bookstores and online at Amazon.com, BN.com, and everywhere fine books are sold. Scott voiced the audio versions of Internet Riches and Click Millionaires himself. The books have been translated into many languages worldwide, including Russian, Polish, Vietnamese, Turkish, Japanese, etc. His latest book, Click Millionaires: Work Less, Live More with an Internet Business You Love, was a "Community Choice" Award Winner in the Best Startup Books category of the Small Business Book Awards. What is a "lifestyle business"? Why do you say “the riches are in the niches”? Why would you write a book like this? Can you share some examples of people who are succeeding online with lifestyle businesses? Where can readers of Click Millionaires get followup help? Is it really possible to start an Internet-based business when I don’t understand the technology? What kind of business has the best chance of making me money online today? How do you personally help your readers get started online? SCOTT FOX is the Founder of the popular entrepreneur coaching community MasterMindsForum.com and Author of the book Click Millionaires: Work Less, Live More with an Internet Lifestyle Business You Love. Scott is a "Click Millionaire" serial startup entrepreneur, executive, podcaster, and Author whose startup business strategy coaching helps solopreneurs, small business owners, and corporations make more money online. Scott has built many multi-million dollar e-businesses ranging from niche online ventures, to Silicon Valley venture capital-backed startups and Fortune 500 corporate web sites, to sites for celebrities like Bill O’Reilly and Larry King. His work and books have been covered extensively in the national and international press including in the Wall Street Journal, Forbes, USA Today, The New York Times, The Globe & Mail, SUCCESS and Smart Money magazines, The Boston Globe, The Orange County Register, Israel National Radio, and many, many radio and podcast programs worldwide. A graduate of the University of Michigan and Stanford Law School, he is the best-selling author of three books: Internet Riches, e-Riches 2.0: Next Generation Online Marketing Strategies, and Click Millionaires: Work Less, Live More with an Internet Business You Love. 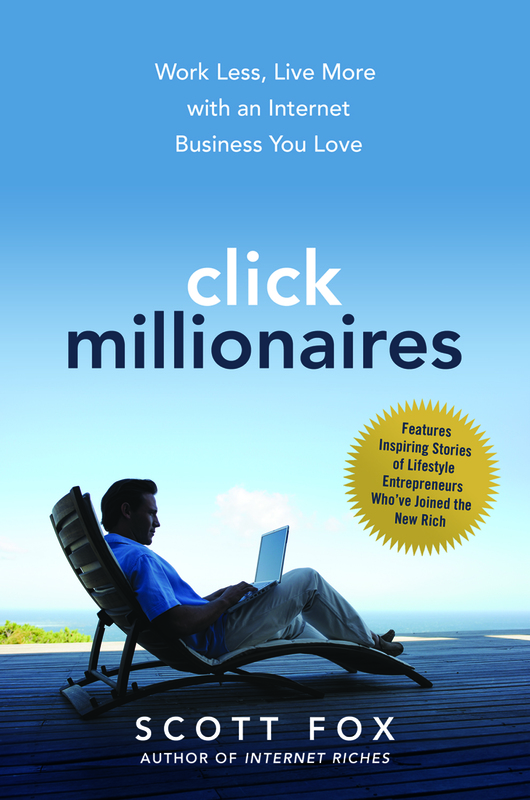 I'm passionate about the Click Millionaires message. So, I'm happy to share that message in person, and my years of expertise, especially if you have an audience interested in e-commerce entrepreneurship, online marketing, website design, or lifestyle businesses. Based on my years of success online as a "Click Millionaire", and my best-selling books, my favorite topics focus around startup entrepreneurship, lifestyle business design, social media marketing, small business growth strategies, online marketing, e-commerce, SEO, online product development, and motivational self-improvement related to increasing business performance, sales growth, self-esteem, and profitability. If you'd like me to address your group, please contact us for a consultation on how we can help inform and inspire your audience at your next conference, meeting, or event. We're happy to work with you on topics, scheduling, and budget to create a valuable event for your group, company, or organization. "When we needed social media training we turned to Scott Fox. His presentation to a diverse set of early stage companies was clear and practical. The feedback we received from the attendees was unanimously positive and his personalized approach to the concluding Q&A session was great." "Scott is an inspiring speaker who makes complicated business strategy exciting, understandable, and executable by anyone. His style is very genuine and I can't wait to work with him again." Please use the Contact Form here to request more details on scheduling, speaking fees, or topics customized for your audience.